We all love to kiss under the mistletoe at Christmas. But have you ever wondered why we do this during the holidays? 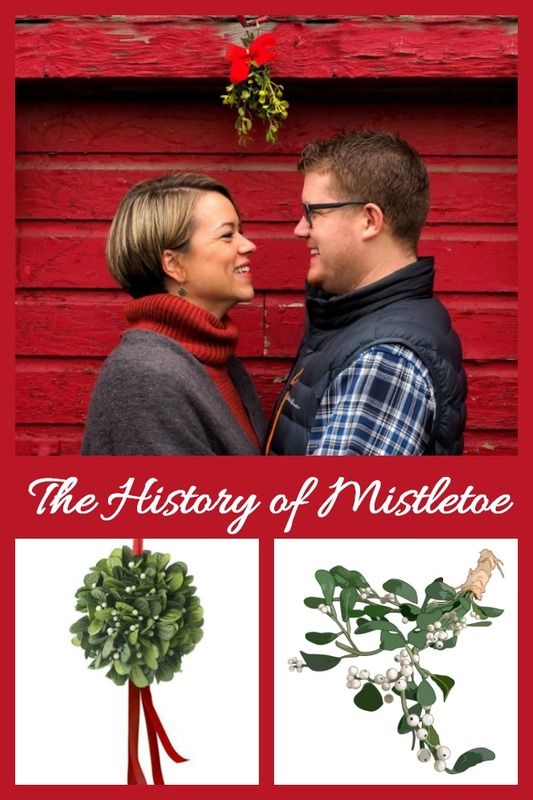 The history of mistletoe actually goes back centuries. 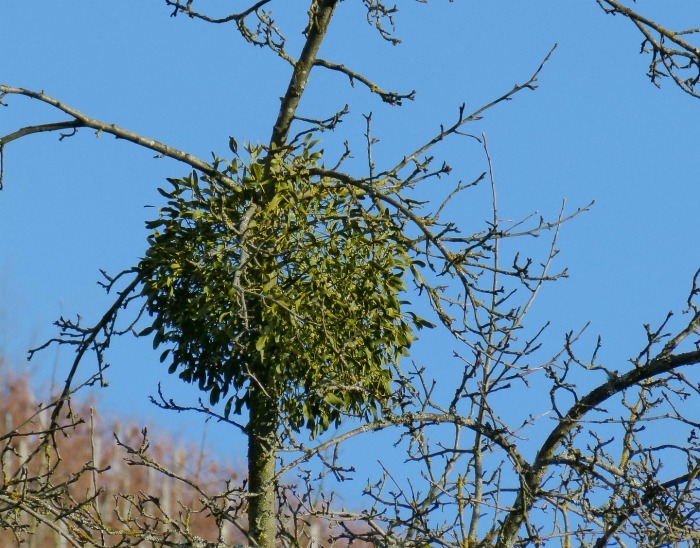 I find it to be an oddity that a parasitic plant, such as mistletoe, has come to be associated with an established tradition of kissing at holiday time. This practice is not a newly discovered way to show affection. It has actual roots in history. 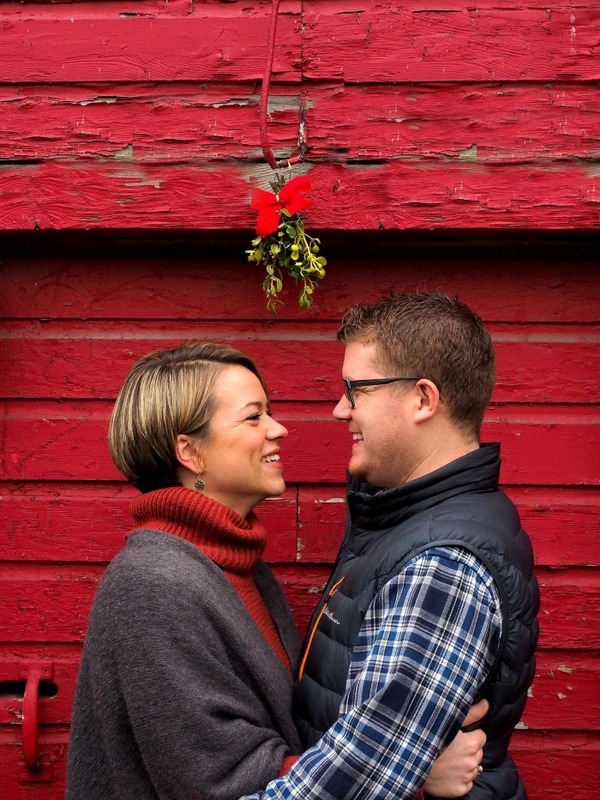 If kissing under the mistletoe brings to mind the topic of a proposal of marriage, did you know that there is actually a National Proposal Day? This day occurs on the first day of both spring and fall. Mistletoe – phoradendron flavescens, is considered a parasite plant. It lives off of other growing plants and trees. Since the plant mistletoe has no actual roots, it finds its way onto logs and trees and forms roots there, staying green in the wintertime, even when the host plant is a bare-limb tree. What color are the berries of mistletoe? We tend to think of the berries of mistletoe as white, since most faux Christmas decorations of mistletoe contain this color. But mistletoe berries can be white, red, or pinkish in color. This depends on the type of mistletoe plant. The berries of mistletoe are poisonous to humans, but birds and other species often eat these berries during the fall and winter months. The birds particularly find the berries enticing and they are quite sticky. If they get some stuck on their beaks, they will rub against trees to remove them, and a host is born. There are two different types of mistletoe. The one that we are familiar with, which is thought of as Christmas mistletoe, is native to North America and grows as a parasite on trees along the east coast of the country and down to Florida. It is often found on oak trees. There is also another type which is European mistletoe- viscum album. This type is often seen on apple trees, but rarely on oak. 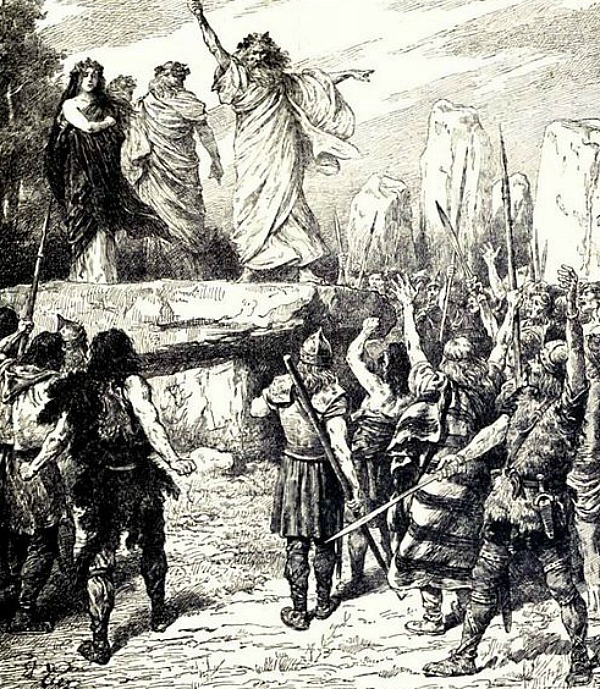 The use of mistletoe in folk lore dates back to the ancient Druids. 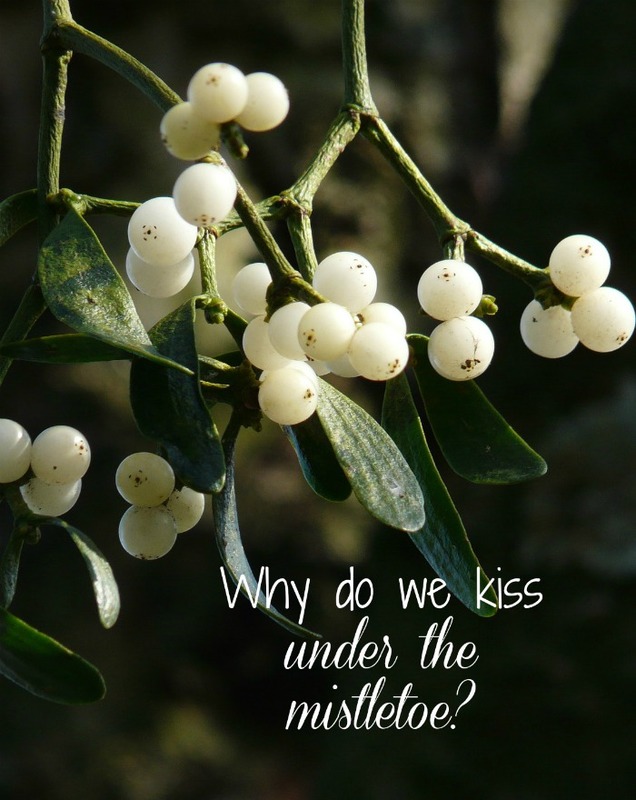 They believed mistletoe to be a sacred plant and it was used in many of their rituals. They thought that mistletoe had mystical powers and held the soul of the host tree. The story from Norse Mythology is that a blind god Höðr (Hod,) twin brother of Baldr and son of Odin, was tricked by Loki. Their mother made everyone and everything in existence swear to never harm Baldr. Unfortunately, she did not think that the mistletoe was important enough to ask that it not harm him. 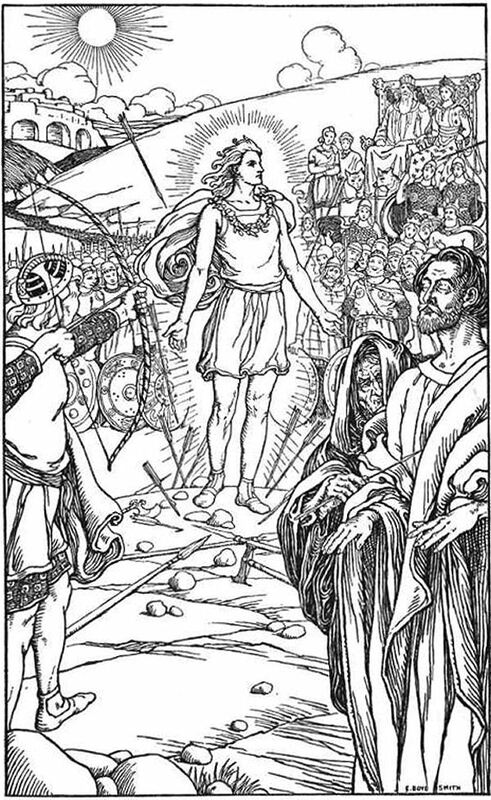 Many gods had tried to harm Baldr and always failed, until Loki made a spear from mistletoe and tricked and guided Höðr to shoot it at Baldr, killing him. 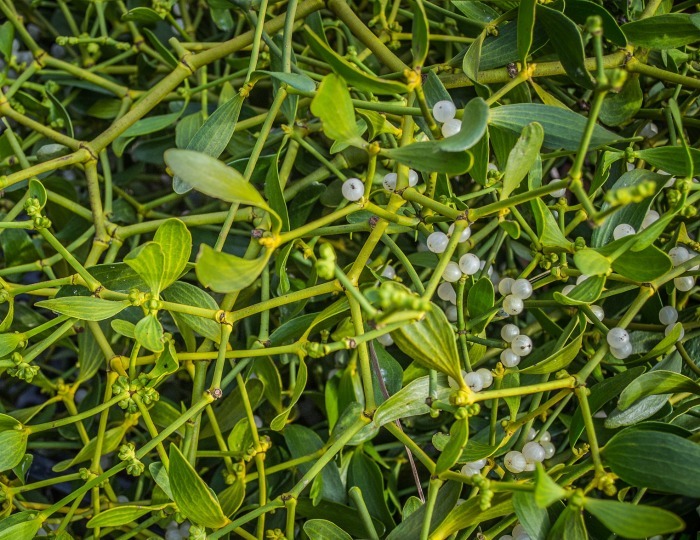 The mistletoe plant was believed to have specific powers. It was hung on stable doors to ward off evil spirits, and also on home doorways since it was considered a symbol of fertility. The practice of kissing under the Mistletoe originated with the Roman festival of Saturnalia, the festival or celebration of Saturn. Just like at Christmas now, kissing under the mistletoe started with the onset of Saturnalia. 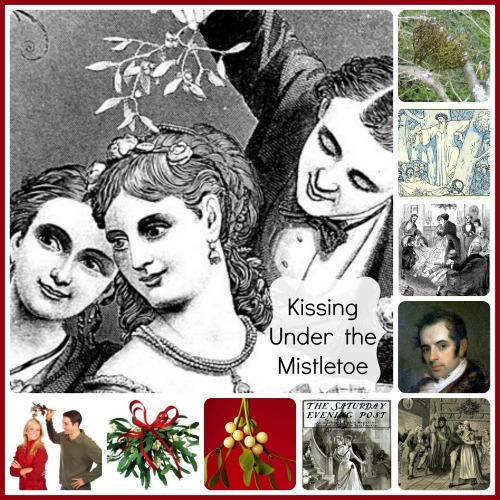 There is hardly a mention of mistletoe in literature in England until the 18th century. But after this, and particularly in Victorian England in the 19th century, the mention of it flourished all over Europe. There were specific rules to this tradition in England. The gentleman would pluck one white berry while kissing the lady on the cheek. One kiss is allowed for each berry. When the berries were done, the tradition was finished. If a girl refused to kiss, it was said that she should not expect any marriage proposals for at least the next year! 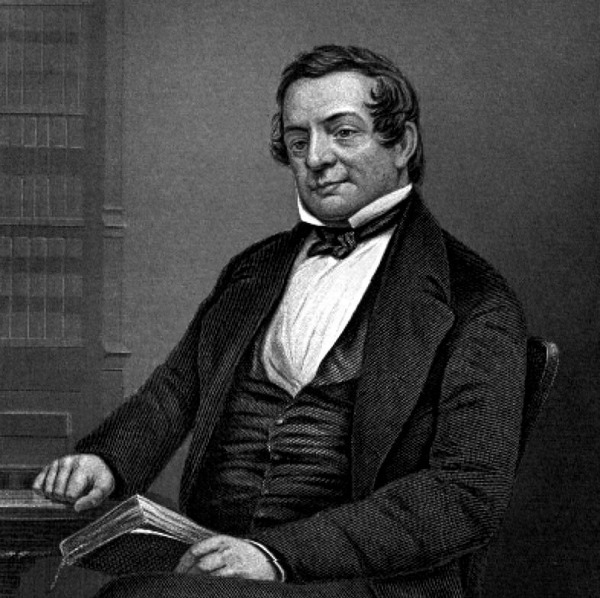 Washington Irving, in the story Christmas Eve, even told of the typical festivities surrounding the Twelve Days of Christmas, including kissing under the mistletoe. Image shared from The War of 1812. 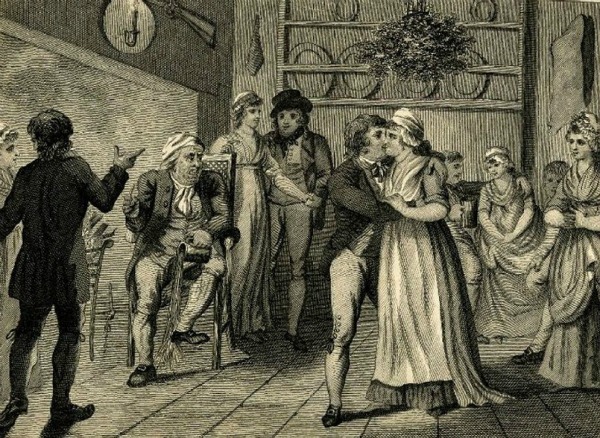 Today we tend to think of kissing under the mistletoe by having a sprig of it held above our heads, but kissing balls also date back to Victorian times. The Victorians took the mistletoe kissing to a new level with their “kissing balls, ” many of which were quite elaborate. And the practice was not limited to the gentry as the photo above shows. It was widespread with common people too. 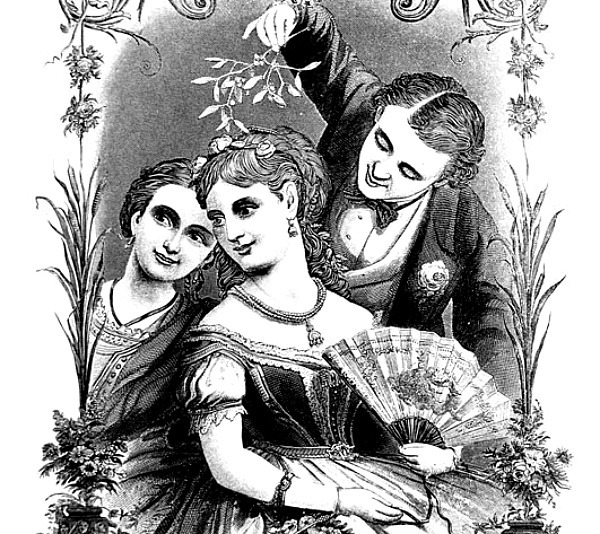 The Victorians used actual mistletoe plants but modern day kissing balls. Instead of just sprigs of mistletoe, the branches, complete with berries where shaped into ball shapes and used as holiday decorations. The kissing ball was now thought to mean romance, rather than mere good will to one another. At parties, dancers would waltz under the balls that had been decorated with mistletoe to get a kiss from their partners. Today, mistletoe kissing balls are often made from silk flowers with plastic berries so that they can be stored from one season to the next. Eventually, sprigs of mistletoe became more popular than other types of decorated greenery like mistletoe balls and have become the symbol of holiday affection that we know and love today. 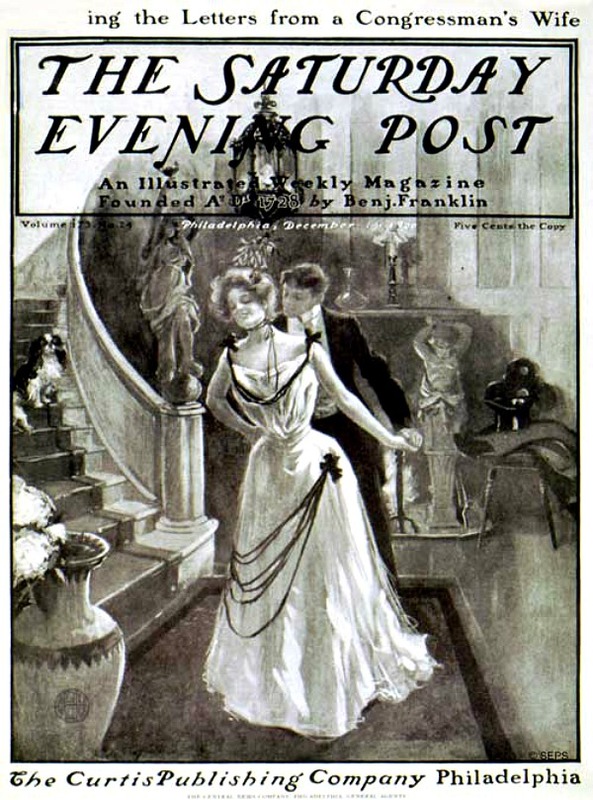 This cover from the Saturday Evening Post shows how we often use mistletoe today, with a single sprig over a woman’s head being enough to initiate the kiss. Often the man holds it himself! The practice has continued into modern day. Many Christmas movies feature it and Christmas decoration often have mistletoe sprigs and berries as a part of them. We have a mistletoe ball handing in the doorway to our kitchen to entice any guests to take part in the tradition of kissing under the mistletoe. We moderns have conveniently forgotten the part about plucking the berries, and also from the stopping from kissing under the mistletoe when the berries run out, since it is so much more fun to continue! 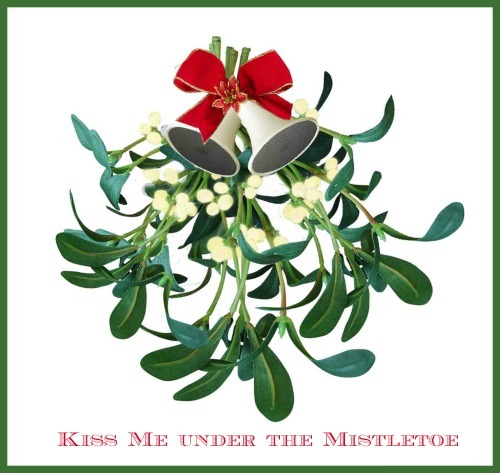 Is mistletoe tradition a part of your Christmas celebrating? Please tell us about it in the comments section below. 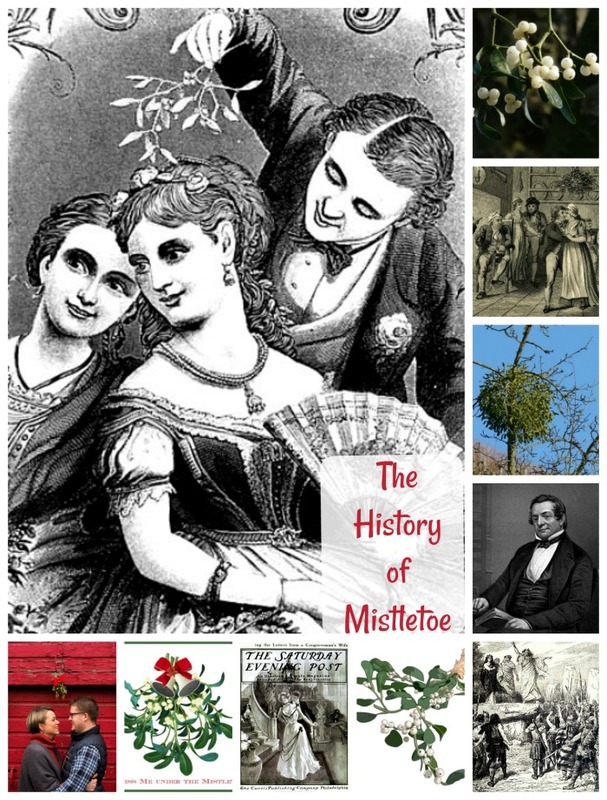 Would you like a reminder of this post about the history of mistletoe? Just pin this image to one of your Christmas boards on Pinterest so that you can easily find it later. Admin note: This post first appeared on the blog in November of 2013. I have updated the post with additional history facts, more photos and a video for you to enjoy. When I was small my Grandfather had a tree in his front yard with mistletoe growing at the top. My Grandfather and my Father use to get out their guns and shoot the mistletoe down. I haven’t thought about that in years. Thanks for the information and the memories. My pleasure. I’ve never seen it growing wild. We see this stufff growing all the time, every year we used to pull some off the tree, and go around being pests with it, all the younger kids acted like it was gross to get kissed! LOL Great times!! Cute story! Thanks for sharing it. 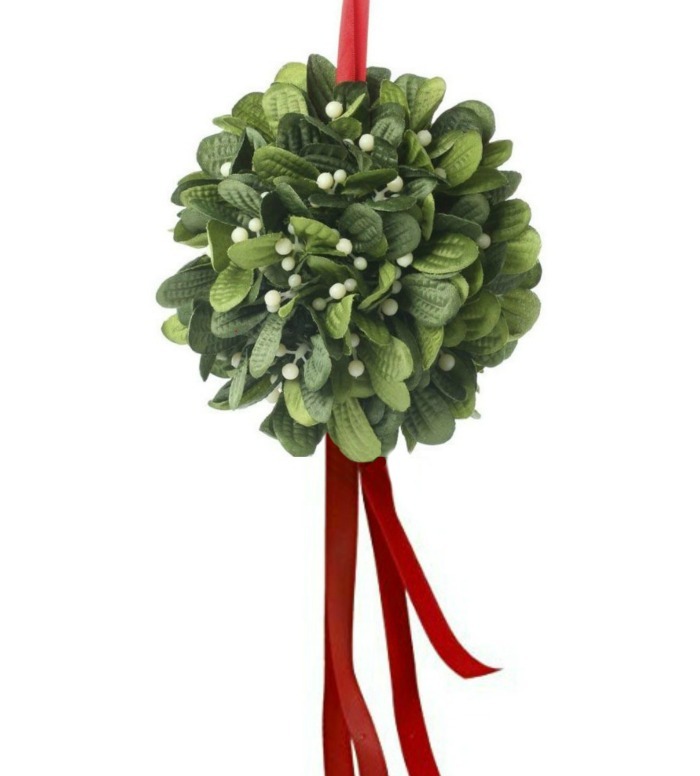 I just bought my first mistletoe to hang it at the door of my room, me and my husband have a lot of kissing to do…. I have a ball of it hanging in my kitchen. Since my husband loves to eat, we make good use of it! Here in Fla,. we have what they call Fla. holly it has red berry’s, it’s of the milk weed family and yes, it to is deadly, but it is really bright colors and long lasting when picked for the door way. Kiss Kiss Kiss.